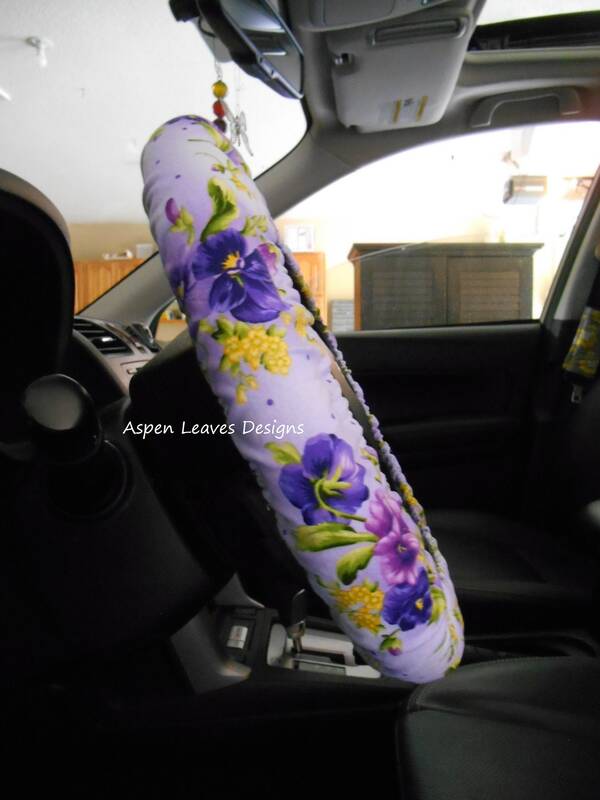 Pansies steering wheel cover. Purple flowers on purple fabric. Fully lined car accessory. Yellow and purple spring floral. *Orders normally ship 24 to 48 hours after you purchase. All orders are made and shipped in the order I receive them. * All covers are lined with a second layer of solid cotton fabric for a thicker cover. * Each cover has 4 large pieces of grip stop fabric included in the price. Full coverage grip stop is available for an extra amount. * I offer detailed sizes so you get a good fit. Please measure your car as the sizes listed below are for example only. I personally do not know the size of every steering wheel in every car. * Some fabrics have extra accessory's available for an extra cost. * Always measure your steering wheel before ordering to get the right fit. * Care instructions - Machine wash, hang to dry. If you cover gets extra stretched out, toss it in the dryer for a short time. * Handmade in a non-smoking home cat friendly home. Please make sure you have read and understand return policies. Time is limited and I DO stick to my policies. I don't exchnage one fabric for another once the item is shipped. Pink and red rose steering wheel cover. Fully lined car accessory. Floral car decor with purple butterflies. 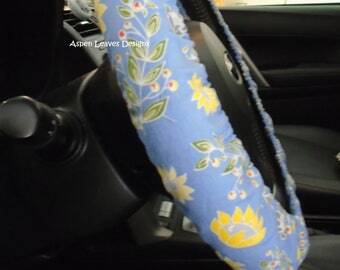 Yellow flowers on blue steering wheel cover. Relaxing blue and yellow floral. Fully lined car accessory. Pink and blue rose steering wheel cover. Small floral on black. Fully lined car accessory. Small coral roses steering wheel cover. Peach fabric. Fully lined. Purple and yellow steering wheel cover. Fully lined car accessory. Yellow and purple floral. Hedgehogs steering wheel cover. Hedgehogs in flowers. Fully lined car accessory. Playing hedgehogs on green. 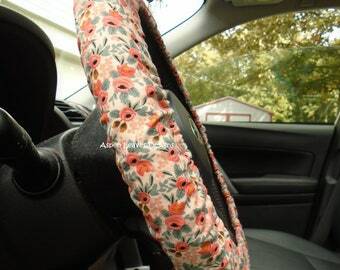 Small flower steering wheel cover. Small bright flowers on black. Fully lined car accessory. Tiny pink roses steering wheel cover. Miniature rosettes. Fully lined romantic car accessory. This fit my steering wheel perfectly and was so much easier to get on compared to other covers you buy in store! Large sunflowers on blue steering wheel cover. Fully lined. Yellow and gold on sky blue. #3Ships fast. Large red rose steering wheel cover. Fully lined red floral car accessory. Sunflower Steering wheel cover. Yellow and gold with green leaves on brown fabric. Fully lined. Trendy floral.Ships fast. Blue flaming skulls steering wheel cover. Fully lined skull car accessory. *Ready made items ship within 24 hours of being ordered, excluding Sundays and holidays. *Steering wheel covers normally ship within 24 hours of you order being placed, but no longer than 3 days after. Steering wheel covers are made to order to suit what you need. *Please note that shipping times may be slower during the Christmas holidays. Pictures are provided in each listing showing how to measure. It will take 5 minutes at the most to do this. I know this is a hassle, but my covers are made to fit your car so you don't get a cover that slides around while you drive. I don't make a one size fits all. General sizing information is provided for you from previous orders that I have made. These are suggestions. * Contact me within 3 days and have it back to me in 14 days. You must immediately return with tracking. If your return is lost there will be no refund. *A return must be in unused condition. Any product returned in any condition other than original would be void of a refund. No smells, stains, rips, holes. If you have used the item at all, it may NOT be returned. No Exceptions! Unauthorized returns will not be refunded. If you return without asking first, you will not be refunded for the return. *All returns, and refunds should be finalized within 15 days after the original order was placed. -->Make sure, that you seal the return package very well. If it gets back to me opened and empty, you will won't a refund! *I'm not responsible for packages lost or mis-delivered due to wrong address provided by customer at checkout. You can see your address multiple times when checking out. Please verify that it is right. You will be refunded (minus shipping) upon return, but that usually takes several weeks weeks to months. *If you are eligible for a refund, it will be processed withing 2 days after I get the item back. *Sometimes another household member received the package and placed it somewhere within the residence. It could also be with a neighbor. *You can request the GPS coordinates of where the package was delivered at your local post office. The delivery driver's scanners have that information. So if for some reason it was left with the neighbor it can be tracked down. Do you think your package was stolen? You will need to file a Suspected Mail Theft Claim with your local post office. You might also want to file a “stolen mail” report with your local police so that there is a record of mail theft in your area. My handmade products can only be purchased here on Etsy, (Aspen Leaves Designs) or on my website. (AspenLeavesDesgns.com). *If you bought it somewhere else, and paid either a much higher price, or a much lower price, it did not come from me. I am not responsible if you didn't get an item, or have problems, because you bought it from someplace else. *If you don't have an receipt provided to you from Etsy that says Aspen Leaves Designs on it, then you didn't buy from me, and I am unable to help you. I always send a packing slip / receipt with my orders. Please beware. Scammers are everywhere. You entered the wrong 'mail to' address. Due to so many packages being sent to 'old' or wrong addresses, I am no longer auto re-sending your package for free. These packages take Months to get back to me, and most people don't bother to ask where their package is for months. From now on, when a package is returned to me because the wrong address was provided, one of two things will happen. You have THREE (3) chances to verify your address at check out. 1- I will reship to you, if you pay full postage costs again. 2 - It will be refunded -minus shipping- and put back up for sale. Unless you contact me within a couple weeks looking for a lost package, the second option is what is going to happen. If you still want the items, you can repurchase and have it mailed again. 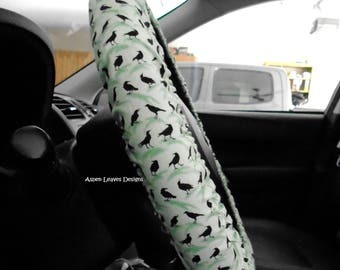 Crow steering wheel cover. Fully lined trending crow car accessory. Peacock feather steering wheel cover. Fully lined pea bird feathers. Jade and blue. Buffalo skulls steering wheel cover. Southwestern style. Fully lined car accessory. Dream catcher steering wheel cover. Cream color fabric. Fully lined native car accessory. Southwestern steering wheel cover. Fully lined car accessory for men and women. Turquoise and brown car decor. Tiny purple roses steering wheel cover. Miniature rosettes. Fully lined floral car accessory.